That kind of question will always get my attention, of course. Nathan Rogut and Carl Sundquist had an idea. 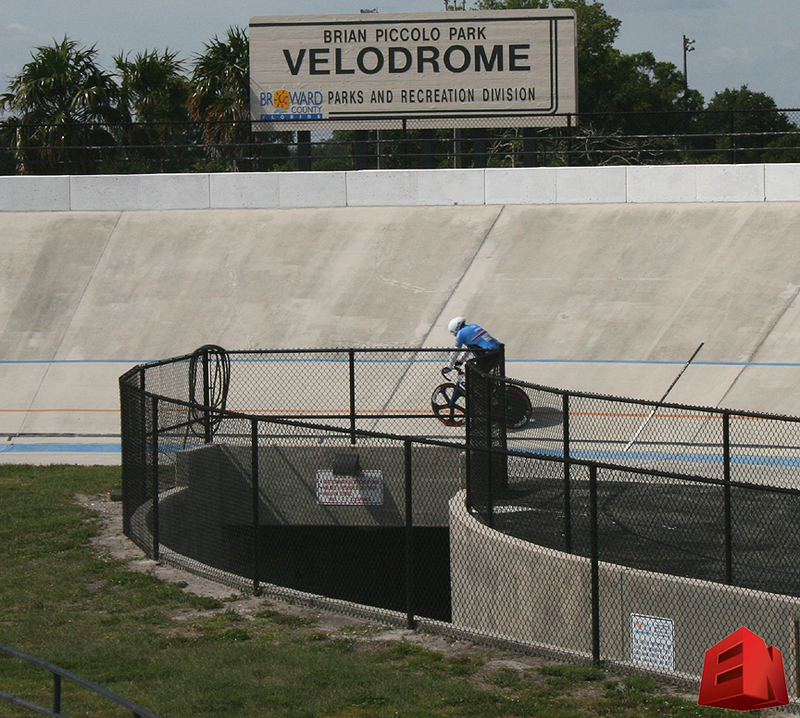 They felt the cycling velodrome at Brian Piccolo Park was underutilized. They wanted a promotion, or a publicity stunt, to get people’s attention on the track. 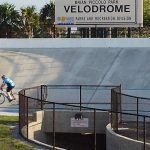 You can’t just drive down to the velodrome, ride around one hour and say “Hey, here’s the new record.” No, there are requirements. It has to be “approved” by a governing body, maybe even two or three. 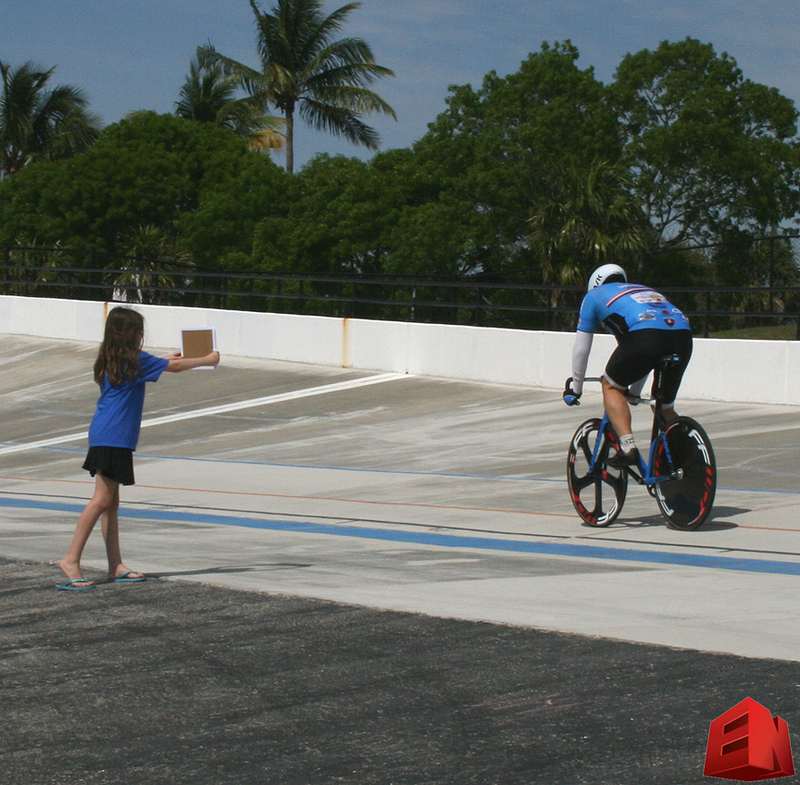 American Track Racing Association (ATRA) approved us right away. 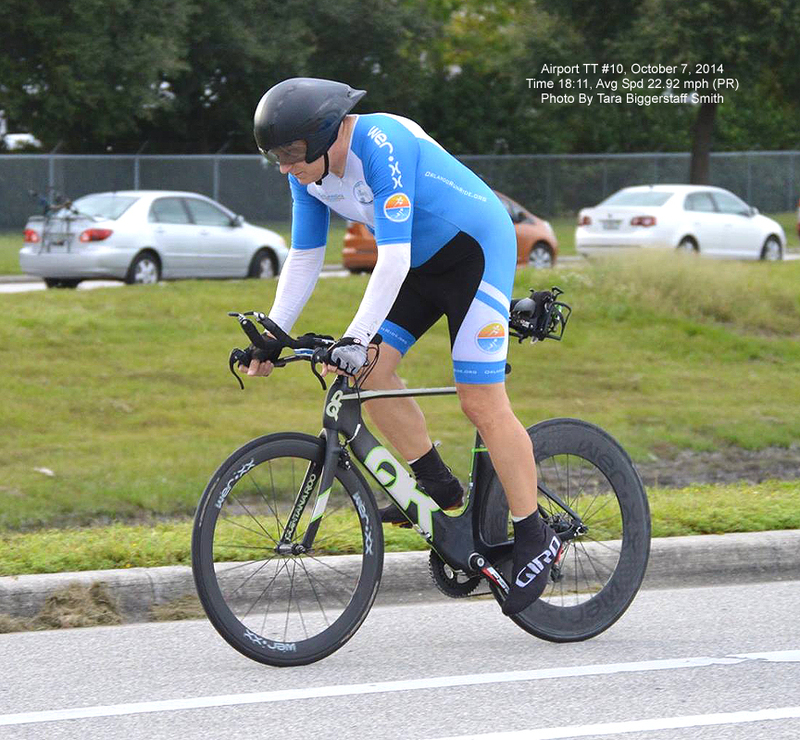 USA Cycling (USAC) and Florida Bicycle Racing Association (FBRA) took a few more hoops to jump through. 1: No drinking of fluids is permitted during the attempt. This is a safety hazard if water is spilled on the track. 2: No performance measuring devices permitted on the bike frame. We interpreted this to mean I could start the Garmin and put it in my pocket, but not allowed to look at it during the ride. That would be a first for me. I’ve always had at least a speedometer. We had to pick a day that met everyone’s schedule. Nathan is a busy coach and trainer. I am running three businesses. 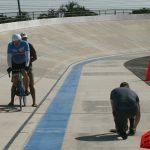 Carl had to coordinate with other activities on the track. Family considerations came in to effect. Many kudos to my wife Kathleen for agreeing to do it on the Saturday of Mother’s Day Weekend. I got this ALUXX/composite frame and carbon handlebars for a tremendous price. Track bikes are not hard to find if you shop around. 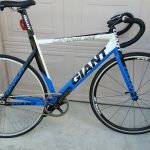 Although there are UCI legal bikes available at the velodrome, they didn’t have any by my team sponsor, Giant Bicycles. I asked my Giant rep if he had one available. No sorry, he said, we don’t stock them. 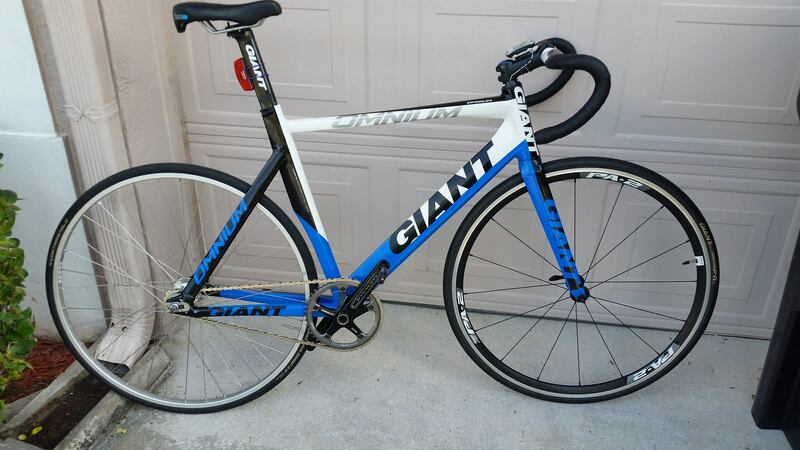 We were able to find a used Giant Omnium frame in my size for a very reasonable price. It also came with a decent crank set and a nice set of carbon handlebars. They were not aerobars, and since they were carbon I easily resisted the temptation to clip some on. Yes they would have been faster but the worry factor wouldn’t have been worth it – worrying about falling and planting my face on the track. 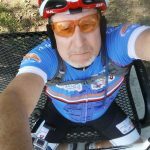 There were many, many problems getting the bike, with a breakdown in shipping, just from Tampa to Orlando (NEVER use USPS). It took two weeks to get it and delayed the attempt. We originally planned to do middle of April, pushed it to May 6, and then finally to May 13. At least I got a week to ride the bike around my neighborhood and get familiar with a fixed gear and my legs as the only brakes. I’m glad I kept most of my TT “accessories” after I sold the TT bike. I had skin suits, speed suits, aero arm coolers, and of course aero helmets. Less stuff to have to try and dig up or borrow. Nathan agreed to let me use his aero wheels for the attempt as well. Still, I had to buy a back wheel for practicing, and they aren’t cheap. You need a special fixed gear wheel, a cog, and a locking nut to keep it from coming off as you brake (by pushing backwards on the pedals). I rode the fixie with no brakes (except my legs) down several streets to ride on Little Econ Trail. The Trail was fine but stoplights and side streets were a little thrilling. I took it home and rode it around my neighborhood for a few miles. That was a startling revelation. I haven’t ridden a fixed gear bike since I rode a tricycle at age 4. OK well maybe a few times I rode a “Big Wheel” in the Patrick Cup International but that is a different story. Riding around with no brakes but your legs is “fun”, too. Takes a lot of getting used to. Eventually I was able to ride around my neighborhood, the big loop, and even hit some speed. I think I hit 28mph a few times. It’s a new feeling, always pedaling. 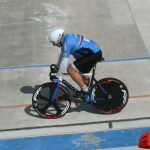 When I rode my Propel later that week I felt sinfully comfortable with a freewheel hub and brakes. 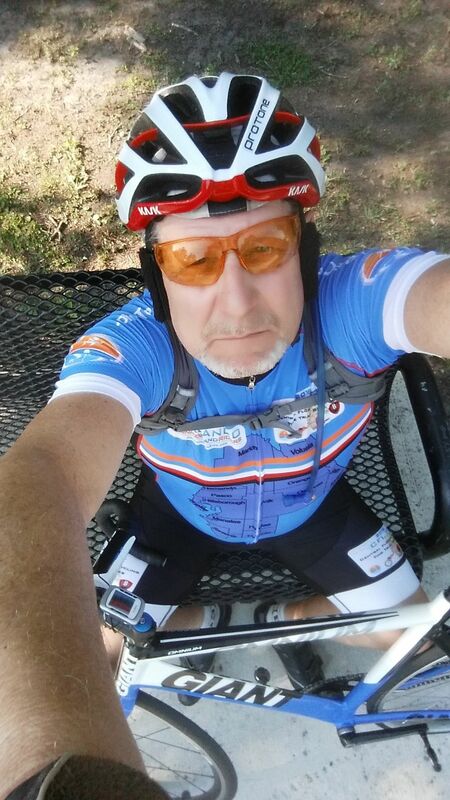 After several rides, I felt comfortable enough to take it out on main roads, like Lake Underhill, Rouse Road and Highway 50. Yikes it is scary around intersections. Stopping and starting require a new set of skills and I was always worried about a car coming out of a side street or driveway. There are two ways to enter the track. The correct way, through the tunnel, and the incorrect way, of walking across it from the spectator area. 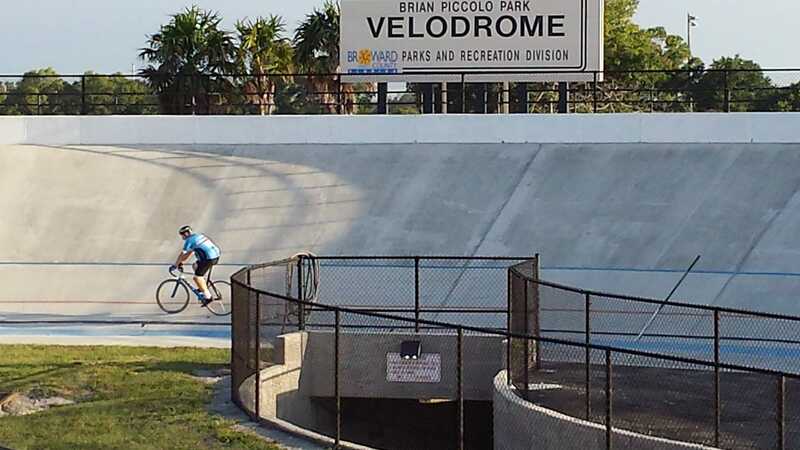 Brian Piccolo Park is in Pembroke Pines, FL, not far from Ft. Lauderdale. That’s very “south Florida” so I was ready for a lot of heat and humidity, even more so than Orlando. The sea breeze helps to cool it down but of course that causes other issues riding. The track is built of concrete, open to the sky, and features 32 degree banking in the turns. The distance around on the black line (approximately one foot above the bottom of the track) is 333.33 meters, so 3 laps is 1K. 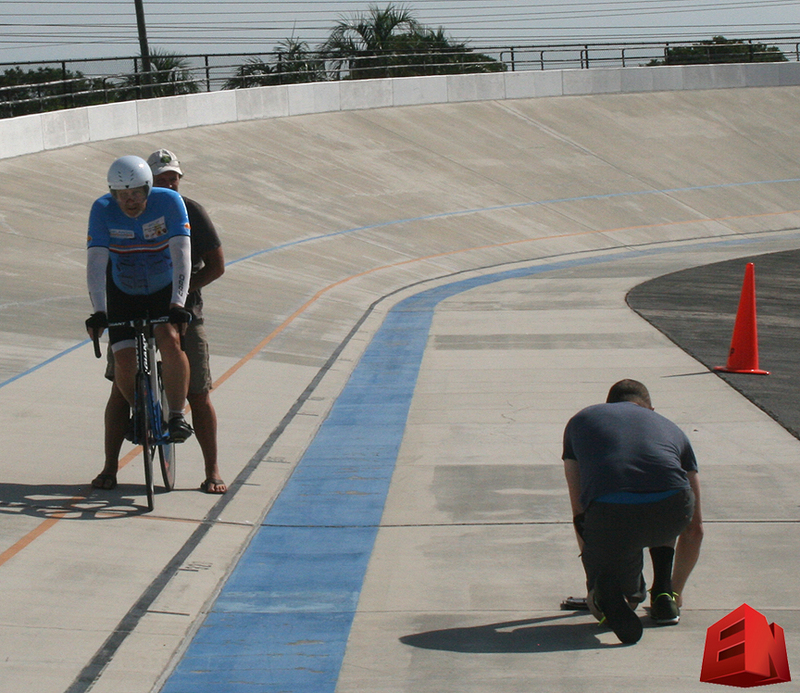 People should enter the track from the tunnel when there is riding going on but they don’t always follow the rules. Several times during my practice laps, and even a few times during my attempt, people were walking across the track to the spectator gate on the high side. In future attempts I will lobby for putting a security person at that gate, and restricting people from crossing the track when it is busy. The track itself surprised me. I was expecting it to be absolutely smooth. It is not. There are some bumps, particularly in the turns. Not enough to make me say “Gee this is rough”, but certainly enough to make me pay attention. It’s not a hazard or anything but you can feel the bumps when you go over them. As previously stated the wind is a factor. Obviously a head wind is painful. Crosswinds (particularly gusts) make the high speed turns “interesting” to say the least. I wasn’t sure what to expect in results. I knew I could maintain 20 to 21 for an hour, because I had done it in 40K TTs. It’s relevant to point out that the actual lap would be longer than 333.33 meters, as it is possible but not probable that I would stick to the black line all the way around. This proved to be true, at least according to my Garmin, which measured 20.3 miles for my 19.65 mile finish. It’s also relevant to point out that I would be relying on my own physical indications to judge my effort. This would turn out to be significant. Practice laps on Friday night were essential to helping me feel comfortable. So glad we decided to go down the night before and get a couple hours practice. I started off a little sketchy but with Carl’s help, I soon got comfortable riding in the 32 degree banked turns. You really don’t have to go that fast to stay upright. After 20 laps or so I started trying different lines, going up and down the banks, and generally just enjoying it. It really is fun. 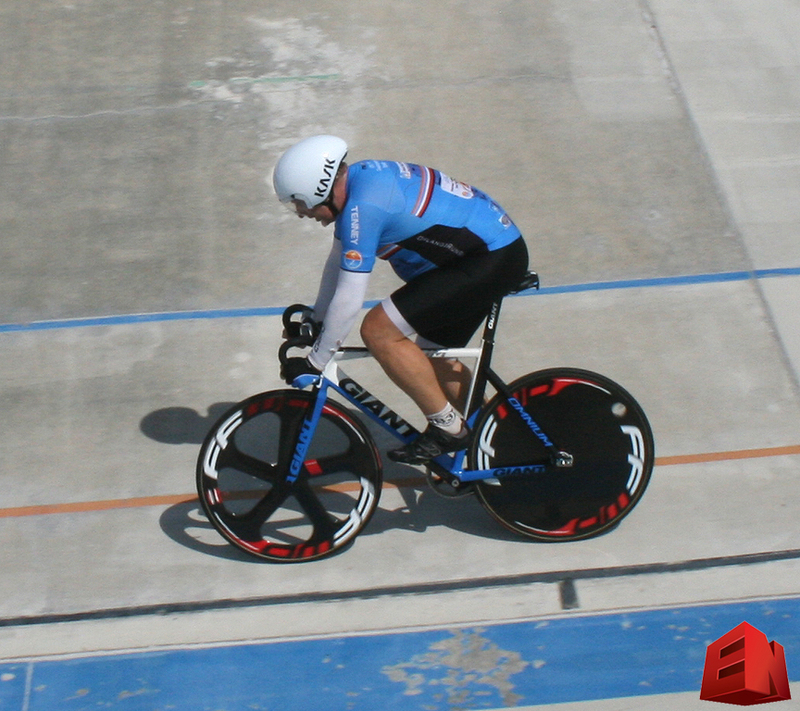 On the whole list of do’s and dont’s in life, riding around on a velodrome is definitely one of life’s big do’s. You should do it. You really should. If you are interested in attempting a record, or just riding around the track, you can use the contact form below and I will send your info to the right people. We stayed at the Holiday Inn Express which is nice enough, but do not, repeat do not order food from Marco’s Pizza. After 2 1/2 hours and them just hanging up the phone every time we called, we surrendered and went to Wendy’s for a hamburger. The Start. Carl is holding me while Nathan is preparing the official timers on the right. My first lap was slow, about 44 seconds. Of course I was trying to get up to speed. 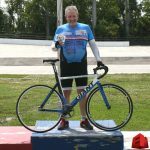 My goal was to average 37.2 seconds or less per lap. That would get me 20 miles in one hour. The wind turned out to be a factor. In addition to a nasty headwind up the front stretch it gave me some whoop whoop moments in the entry of turn 1 and the exit of turn 4. A couple of times I nearly slid off the track. I would adjust to it, or think I had and then a gust would come in and get my attention. Still, I was doing 37 to 39 seconds a lap pretty consistently. I knew this because my Daughter Sophie ran out to the edge of the track holding up my previous lap’s time quite often. It was very helpful. It helped me to know when I was doing well and more importantly, when I was dogging it. It helped me to “pick it up.” She also told me I hit 50 laps in 31:07. That wasn’t too bad. It meant I could probably get to 96 laps in an hour. Unfortunately things started hurting. About 10 minutes the ride my wrists really started to hurt, especially the right one which was on the uphill side. I know now that most of the weight is carried on the uphill hand. I started shaking out my hands pretty much every lap on the downwind back stretch. This stayed with me the whole attempt and was definitely the biggest detriment to my performance. Need to work out some kind of exercise to fix that. I was also fighting numbness in the “nether regions” and had to stand up and pedal an entire straightaway every 10 laps or so. About midway through the sweat was running down in to my eyes whenever I got in to the drops. I had a face shield on, so I couldn’t reach up and wipe it away. I just endured it. 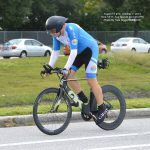 I need to find some sort of skull cap type hat to wear under the aero helmet though, for the future. This resulted in quite a few 40+ laps. I ended up with 95 laps complete (Nathan counted 95, he’s the ref, that’s what counts) which is less than the 97 I hoped for (20mph). Still, I finished it, and had somewhat consistent lap times. In any case, I was now the Florida One Hour Record holder. The judges have made the final decision, so my final result is 19.65 miles. Here is my Strava activity for the effort. Here are the recorded lap times using Kathleen’s timing sheet and the GoPro Video. I have learned to step back after every new endeavor, effort, race, training event, etc and reflect on what I have learned. Most people learn from mistakes, certainly more than they learn from wins. Me too. In the past, I have made some mistakes, errors in judgment, miscalculations, and other gaffs. This was no exception. Of course the biggest lesson I learned is the one I learn at the end of every time trial pretty much. I was driving home saying to myself: “I could have gone faster.” Am I the only one that does that? Anyone else? Anyone? Buehler? Anyone? Do not ever order from Marco’s Pizza in Pembroke Pines! My aero position is terrible. Did I mention I need to lose 20 lbs? So it was an interesting couple of months. Was it worth it? Hell yeah. 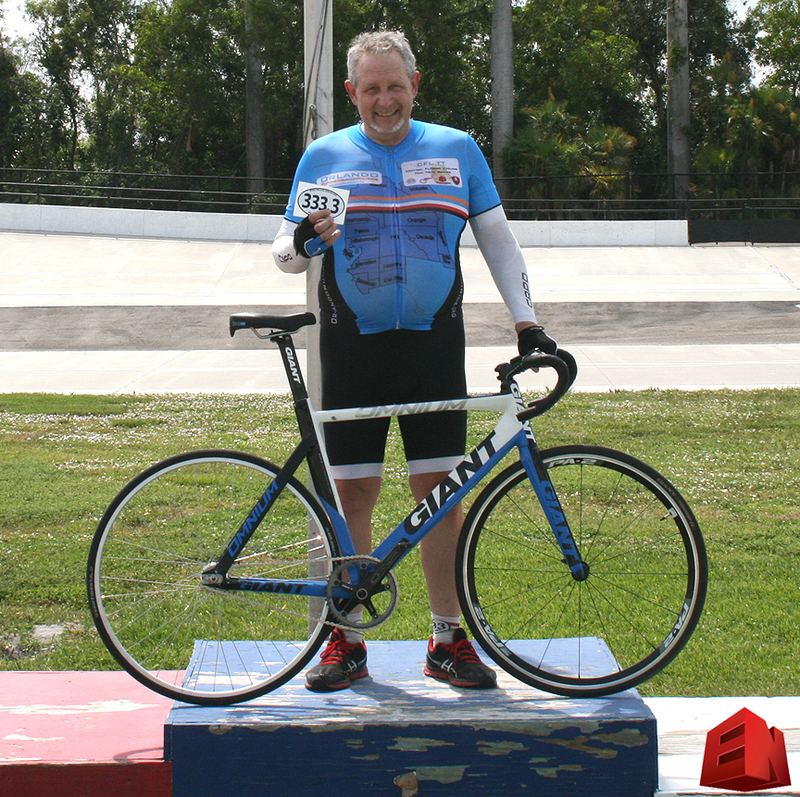 Even if I hadn’t set a record it was worth it just to see how much fun it is to ride a track bike, on a track. Even the street fixie practice was exciting and helped me build new muscles. In the future, we hope to be putting on more of these events. Please let us know here or on Facebook if you would attend a 4K Festival or something similar, where we could add time for attempts at the 5K, 10K, 20K and 1 hour records above. I highly recommend getting out on the track. Hey take a crack at those records. You can do it. If you are interested in riding the track, racing on the track, doing some track time trials, or even a record attempt, please use the contact form below and I will put you in touch with the right people. Or just call me at 407-490-2468. We appreciate your comments and suggestions. Please let us know how to get back to you.